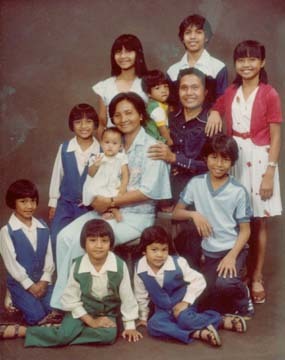 All the Baraquio children are accounted for in this family portrait from 1981. Clockwise from left are Bernadette, Therese, Gloria, mom Rigolette, Maria Cecilia, Albert, dad Claudio, Jerome, Maria Lucy, John, Angela and Rose. I've grown to love the title: Miss America's sister. It would be a great name for a band. It says so many things. To be honest, it was a little awkward for me, at first, for people to find out my last name is Baraquio and immediately shift their attention to my sister Angie. Whenever her name comes up, a whole new conversation ensues: "Are you related??!" "Yes, that's my sister. Yes, so is Bernadette." Then comes the sense of excitement and star-struck glee ... over my sisters. Like what am I, chopped liver? I often have to make the corrections: "No, Miss America, not Miss USA," or "No, FOX2, not Channel 4." And then come the barrage of questions of how Angie's doing and what's she up to these days, as if she were an old friend of theirs. Only after they've exhausted their list of questions does the conversation swing back to me, as in: "So what are YOU doing? The limelight wasn't for you, eh?" Hmm, I'm not sure how I should take that. Occasionally, I come across the more curious type of stranger: "You must hate that people always ask about your sister, huh? Are you jealous of her?" I suppose people would think that might be the case for anyone with a famous sibling -- imagine what life must be like for Britney Spears' little sis -- but I would have to say, more than anything, my sense of pride and respect for my siblings' accomplishments overpowers any negativity stemming from being in the public eye. The year that Angie was crowned led to some soul-searching: how I felt about her, about my family, about society, but mostly about myself. At Gloria's (second from right front) graduation from Moanalua High School in 1998, the family was there. In front from left are Rose, Bernadette, Therese and Angela. Rick Hamada is in the top row at left, standing next to Baraquio brother Jerome. All 10 of us went to Catholic school, joined the choir at various Catholic churches, played music and have played sports. All of us made the top of our class, and all of us are college graduates. Are we Asian or what? Yes, my parents are tough. If they aimed to instill anything in us, it was to have faith in God and to offer everything up to Him. This is how we were taught to excel and to utilize the abilities with which we were endowed, whether intellectual, musical, athletic or social. You can imagine the pressure of being a part of this large, esteemed family, and I am the youngest of the bunch. I mean, there are all kinds of things going on in this family: Filipino customs meet American Dream, Old World vs. New World. There's sacrifice, selflessness, unity, diversity, competition, expectations, co-dependence -- pretty overwhelming! While we all learned to work together as a team, we each tried to find (maybe subconsciously) what distinguished us from the rest of the siblings. Each of us did seek a niche, but every little thing that anyone did had an effect on the whole family. 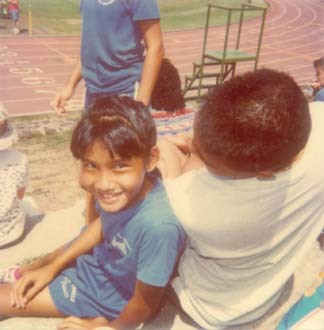 Pictured above at age 12 at a Catholic School League track meet at Punahou. I BELIEVE Angie becoming Miss America in October of 2000 affected her family and friends just as much as it did her. Everything changed while they tried to remain the same, like a "keepin'-it-real-cuz-I'm-still-Jenny-from-the-block" kind of thing. Like we always had to remind her where she came from, that she's just Angie, local girl, our sister, as if she could ever forget it. No one wanted her to change, and yet in the meantime, everyone else around her was changing. The family was affected by her fame, reaping benefits for being a Baraquio, and yet maybe losing points for not seeming as accomplished as Miss America. It got pretty old for me, to be constantly bombarded by the "Are you related?" thing, as if my identity were not enough. I realized that was what caused me to feel the slight insecurity about being her little sister. I consulted with Angie and my parents quite a bit about it. She sympathized with me and expressed her pride in me and all her siblings for our individual accomplishments. She reminded me that each of us has a different gift. In our family we have an architect, a counselor, a reporter, a teacher, a promoter, business owners, account executives, travelers, mothers, fathers, singers, pianists, guitarists, drummers, dancers, basketball players, runners, artists -- but there is so much more beyond these mere labels. My parents would remind me to, in turn, be proud of Angie's achievements and expect that people are always going to be curious about her. It must have been then that I decided to enjoy being Miss America's sister. I guess all of this has made me reconsider what it means to be a celebrity. It's a funny thing, what fame will do to people -- both the celebrity and the celebrators. Ultimately, the celebrity is still a person, with pains and fears and taxes to deal with, just like everyone else. But the superstar we recognize on the television, in magazines or on the radio also stands as a symbol, an icon to which we attach our ideals. Then when we meet the personality, unreality becomes real and it's jarring for us. 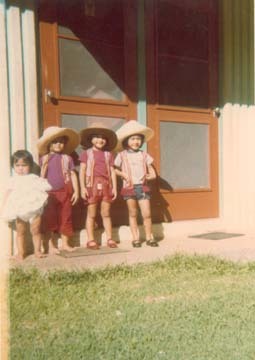 Angela and three amigos -- from left, Rose, Bernadette and Therese -- pose outside the Baraquio's Palolo house in 1978. Angela will be honored, along with Gov. Linda Lingle and Winners' Camp founding director Delorese Gregoire, at Soroptimist International of Waikiki's "Making a Difference for Women" program noon Tuesday at the Pacific Club. Celebrity stuns us because we forget. We forget that these are real people with real lives. We think they have it so easy because they have notoriety and, often, money. As a witness to my sisters' lives, I know it's not always that simple. As public figures they are always judged by impossible standards. I think Angie and Berna being in the spotlight has made us all reconsider what it means to be a Baraquio, especially living on this small island of Oahu. Everyone knows everyone and everyone talks, so you must be careful of what you say and how you act because you are a representative of the family. Sometimes it's like the world is watching, so you can't completely be yourself. Dress code: mask. Take your places, everyone. I'm not so sure it has to be that way. I just think it's important to remember that the 10 of us really are individuals, with unique capacities, unique experiences, unique dreams and unique perspectives, even if we do share the same last name. Being the baby, I felt a lot was (and still is) expected of me, from my parents, siblings, coaches, teachers and society in general. I was like Toula before her big fat Greek wedding, just not Greek and not nerdy. She thought she had it rough. Everyone thought I would play the piano better or be a faster runner or play a better basketball game or be a smarter student. There was a lot to "live up" to. They say that family will always be there, and in my family, boy, will they ever! To this day, I still get lectures instead of conversation, and whereas I once felt suffocated by a chorus of demands, I now take comfort in understanding their love for me. Every piece of advice came with good intentions, and I appreciate the fact that I have such a strong network of support. Although we may disagree on issues, I respect their opinions and I am open to their suggestions. But I've discovered that the only thing I have to live up to is my own standard. For most of my life, I battled with the fact that I was a Baraquio, but that I was also Gloria. I think I've finally reached the point where I feel comfortable being both. 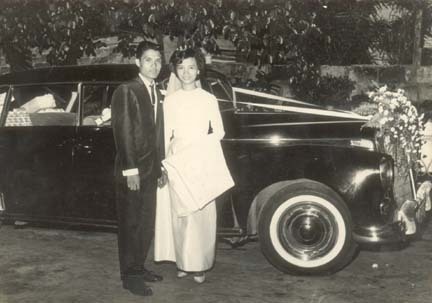 Rigolette and Claudio Baraquio were married in Manila in 1965. You think my immediate family is big -- like many local ohana, I have seven in-laws, nine nephews, one niece and another on the way. Now there are just as many second-generation Baraquios as there are first! As we all get older, start our own families, buy our own homes and begin our own careers, we see each other less than before -- when there were three occupants per bedroom in our household. My eldest sibling, Maria Cecilia, or "Maricel," lives in California, but she tries to visit yearly. My other sister Maria Lucy, or just plain Lucy, lives in Washington, and she tries to make it down here when she can. 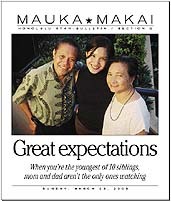 My parents and the other eight children still live on Oahu. My 10 siblings and I spent most of our years together in Salt Lake, after living in the Waialua and Palolo housing, but we have since been dispersed to different parts of the island. Our weekly gatherings are at church Saturday evenings, where we sing in the choir, followed by a dinner picnic in a park. We also try to meet for beach volleyball on Sunday afternoons outside football season. Of course, we plan big parties for birthdays (to follow my parents' sacred tradition) and holidays. Weddings are a surefire way to get the entire clan in one place at the same time. Sometimes, I feel like getting married just to see everyone again. My poor future fiance. 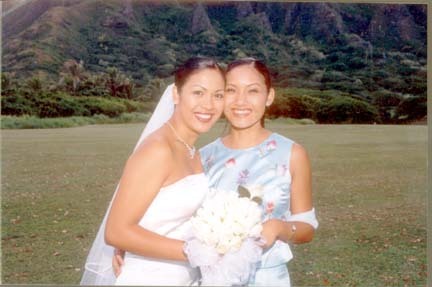 Gloria celebrates Angela's wedding day in 2002. IT'S INTERESTING to see the changes in all of us as time goes on. My parents are more laid back than ever. They spent most of their lives working for us, feeding us, driving us to school, to basketball practice, to piano lessons, watching our games and races, keeping us out of trouble, putting us on restrictions all the time. "Grrrounded!" Coming from my mother's mouth, it was the word we feared most. What it meant was: wash 20,000 dishes, practice piano for two hours and answer no phone calls whatsoever. Now my parents just chill, even though they still have many financial obligations. I see them in hard times, and I ask my mom how she gets through it. She says in her Filipino accent, with a smile: "Offer it up to God. It is OK. We may die anytime." My dad recently suffered from gout for a few weeks, and watching him limp brought me to tears. He's such a country boy, having grown up in Bocboc. (Hey, don't tease!) 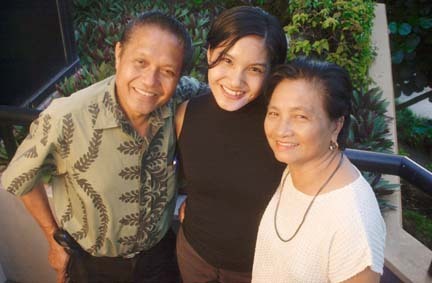 I nagged him for not resting and for not seeing a doctor, and he laughed and said in his Filipino accent: "Gloria, I am not going to let this bring me down. There is so much to do in life!" That just made me cry even harder. Not because I worried, but because I was so touched by his peace. He is so strong in his calmness. I went out to buy my dad some medicine to help relieve the pain in his foot. I called them to find out when I could drop it off, but they were rushing out the door for my mom's acting class. My parents are so OK and I didn't even realize it. Since when was Ma taking acting lessons? She's also taking voice lessons, and they both are learning the piano together. They're too much. I can't keep up with them, and they're like 60-something! They are finally getting to do the things they could never do when they had all of us to raise. I observe them in awe, and I suppose in their example lies the story of the Baraquio family. Gloria Baraquio is an account executive for the Star-Bulletin and Midweek.